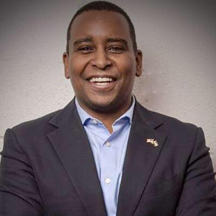 Joe Neguse is America's first Eritrean-American congressperson and Colorado's first Black congressperson. What’s unusual about the nine new members is that all of them prevailed in predominantly White and mostly suburban districts. Five of the nine are women. For most of the 20th century, there were few Black members of Congress. In 1950, only two African Americans (William Dawson of Chicago’s South Side and Adam Clayton Powell of Harlem) served in the House. The civil rights movement and the 1965 Voting Rights Act led to a significant upsurge of Black office holders. By 1970, the number of Blacks in the House had grown to ten and by 1990 it reached 25. Then and now, most Black Congress members represent majority-Black districts, although some today represent districts where Blacks and Latinos form the majority. Of the 47 current Black members in Congress, only six represent districts where Whites represent at least half of the population.